In contact center applications, attribute-based routing is a process of distributing tasks based on any combination of self-defined characteristics. Priority and order: Select the routing priority for each task, such as a First In First Out (FIFO) or Last In First Out (LIFO) algorithm. Time of day routing: redefined attributes make it easy to route tasks based on time of day or day of the week. Agent skills: Specify what skills are required for an agent to take work from each queue. 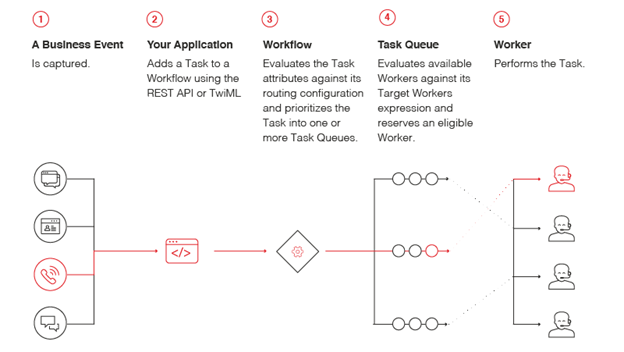 TaskRouter is Twilio’s attribute-based routing engine. TaskRouter can route any interaction, whether it originates from Twilio or another system. When a call, lead, chat, SMS, support ticket, messaging app request, or even machine data comes in, TaskRouter dynamically assigns those incoming tasks to the people and processes that can best handle them based on the attributes you apply, such as skills required by the agent and priority of the task. With TaskRouter, you can define the characteristics of each task with any number of attributes. You can also easily write syntax to route those tasks based on your chosen combination of attributes, including escalation and fallback rules, so you don't have to write custom code. Distributing calls to call center agents. TaskRouter supports common features required in call center environments, such as skills-based routing and task prioritization. Prioritizing and assigning CRM cases to agents. Custom rules can vary the assignment based on time spent in queue and case content. Distributing leads to sales teams. TaskRouter's business rules provide control over prioritization so that teams are always working on the most critical opportunity. With an attribute-based routing system like TaskRouter, customer support agents and other workers are matched to tasks based on their skills. As an admin, you can specify what agent skills are required to take work from each queue and also update worker skills at any time. TaskRouter will immediately update the state and routing logic with no code changes required. Attribute-based routing engines let teams get away from the administrative work of manually routing tasks and back to what’s most important — creating great customer experiences. And of course, it’s easier for them to create great customer experiences when they are given tasks that match their skill set. Attribute-based routing also makes it easier for workers to multitask, since you can specify how many different tasks each agent can handle concurrently, with different limits per channel. For example, a worker might be able to handle three simultaneous chats, a voice call and a chat, or only one voice call at a time. The engine notes a worker's capacity and their activity to determine if they are available for a new task. By using incremental escalation to constantly keep track of every task in the system, wherever it is in the queue, you can define escalation logic to incrementally expand the set of agents who can be assigned to each task. Lending platform LendUp’s mission is to provide anyone with a path to better financial health. LendUp implemented TaskRouter to intelligently route customers’ calls to different specialists by ascribing attributes. If a customer needs to fill out an application over the phone, that call should go to an agent with experience in sales and onboarding new customers. A service queue should go to an agent with support and product expertise. Prioritized customer calls should go to a manager with decision-making power and experience with high-pressure situations and customer retention. Using TaskRouter, LendUp can write their own call routing logic, and let TaskRouter do the heavy lifting. With TaskRouter firmly in place at LendUp, they now spend less time manually directing calls, and more time directing their customers to better credit.